Developed by the National Asthma Education and Prevention Program (NAEPP) Script Notes: Good (morning, afternoon, evening), my name is ________, and I will present “Asthma Basics for Schools.” My goal today is to help you learn more about asthma and the school age child, as well as the role of the school in helping students with asthma. This presentation was developed by the NAEPP, which is administered and coordinated by the National Heart, Lung, and Blood Institute (NHLBI). The NAEPP was initiated in March 1989 to address the growing problem of asthma in the United States by raising awareness of asthma as a serious chronic disease and by providing guidance to ensure its accurate diagnosis and effective intervention and treatment strategies. The NAEPP works with intermediaries including major medical associations, voluntary health organizations, and community programs to educate patients, health professionals, and the public, with the ultimate goal of enhancing the quality of life for people with asthma and decreasing asthma-related illness and death. 3 Asthma is a Major Health Problem in the U.S.
5 million school-aged children have asthma1 Students miss almost 13 million school days each year due to asthma2 Asthma is the 3rd-ranking cause of hospitalization among children under 153 Script Notes: Almost 10% of, or more than 5 million, school-aged children have asthma. On average, students with asthma miss about 2-3 days more per year than students without asthma, although some students with severe and/or uncontrolled asthma miss much more than that. Asthma is serious and can cause students to go to the emergency room or urgent care office, be hospitalized, or in the worst cases, die. Note to presenter: According to the 2004 National Health Interview Survey, parents reported that 9.6% (5.1 million) of their school-aged children (ages 5-17) had ever been told by a doctor that they have asthma and still had asthma. This is sometimes called “current asthma”. Consider adding local data, if possible. 1 Epidemiology and Statistics Unit. Trends in Asthma Morbidity and Mortality. NYC: ALA, July 2006. 2 CDC. Asthma Prevalence, Health Care Use and Mortality, National Center for Health Statistics. Washington, DC. 3 Hall MJ & DeFrances CJ National Hospital Discharge Survey. Advance data from Vital and Health Statistics, Table 3; no 332. Hyattsville, MD: NCHS,2003. 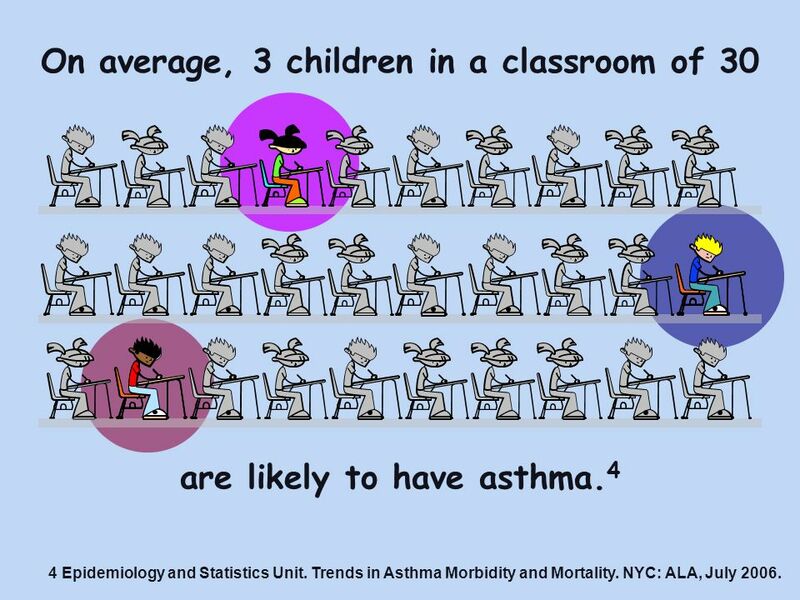 Script Notes: On average, a typical classroom of 30 students is likely to have 3 with asthma*. 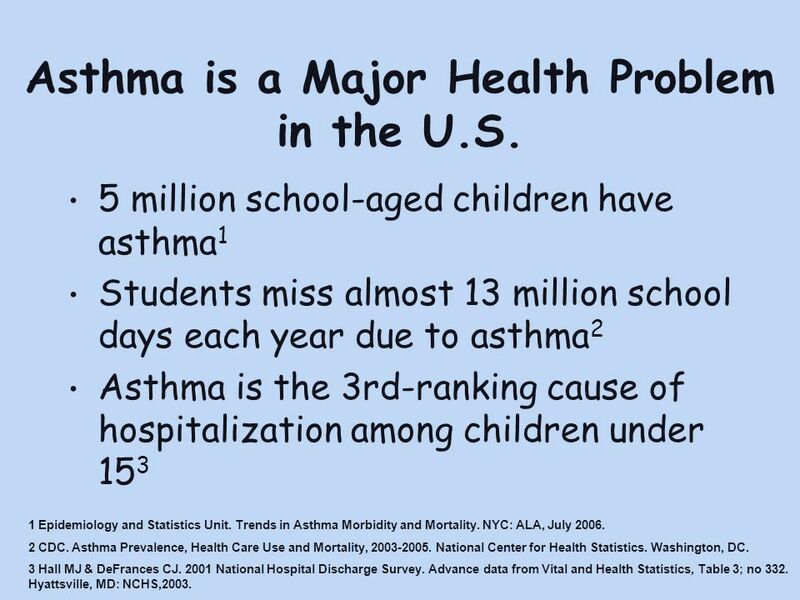 Note to presenter: According to the 2004 National Health Interview Survey, parents reported that 9.6% (5.1 million) of their school-aged children (ages 5-17) had been told by a doctor that they have asthma (“lifetime asthma”) and still had asthma (“current asthma”). are likely to have asthma.4 4 Epidemiology and Statistics Unit. Trends in Asthma Morbidity and Mortality. NYC: ALA, July 2006.
produces recurring episodes of breathing problems is potentially life-threatening can occur at any age is not contagious cannot be cured, but can be controlled Script Notes: Asthma is a condition that: is chronic, meaning that it’s an on-going, long-term condition. 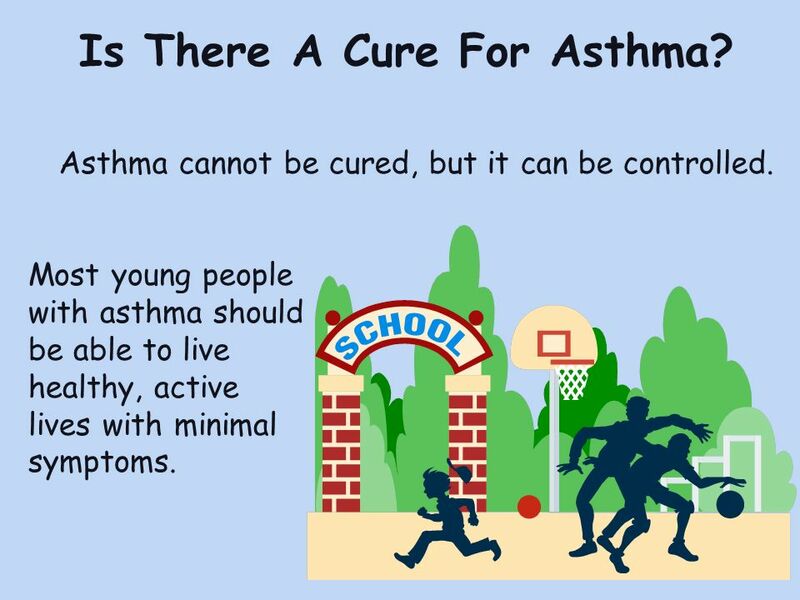 produces recurring episodes of breathing problems called asthma episodes is potentially life-threatening can occur at any age is not contagious, meaning it cannot be spread from one student to another cannot be cured, but can be controlled The cause of asthma is unclear. It is probably caused by a mix of genetic and environmental factors. Note to presenter: Some audiences may need a definition for genetic and environmental factors. Genetic factors are things passed down from your parents. 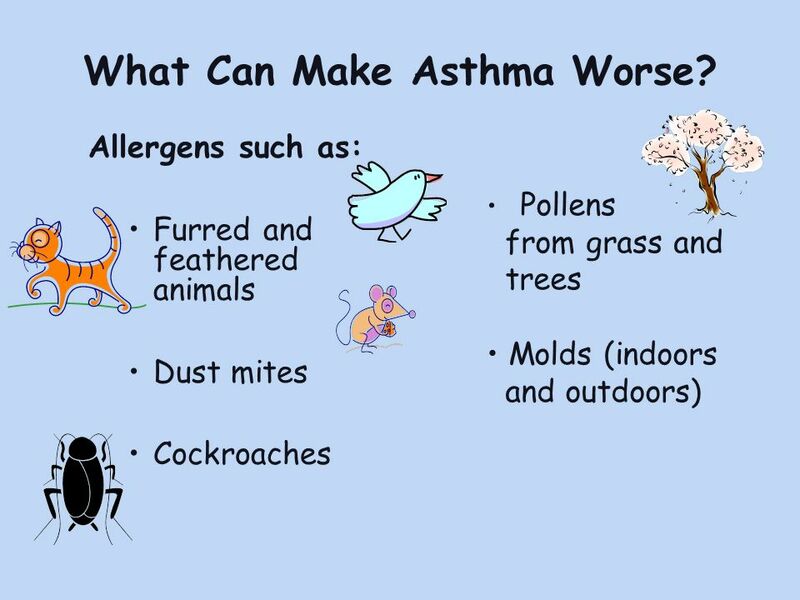 Environmental factors are things in the environment around you that may contribute to the development of asthma. 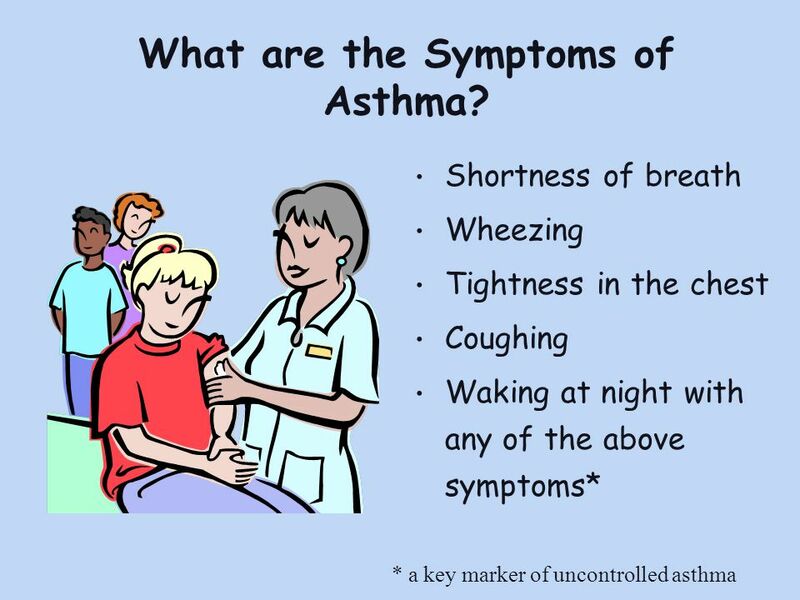 6 What are the Symptoms of Asthma? 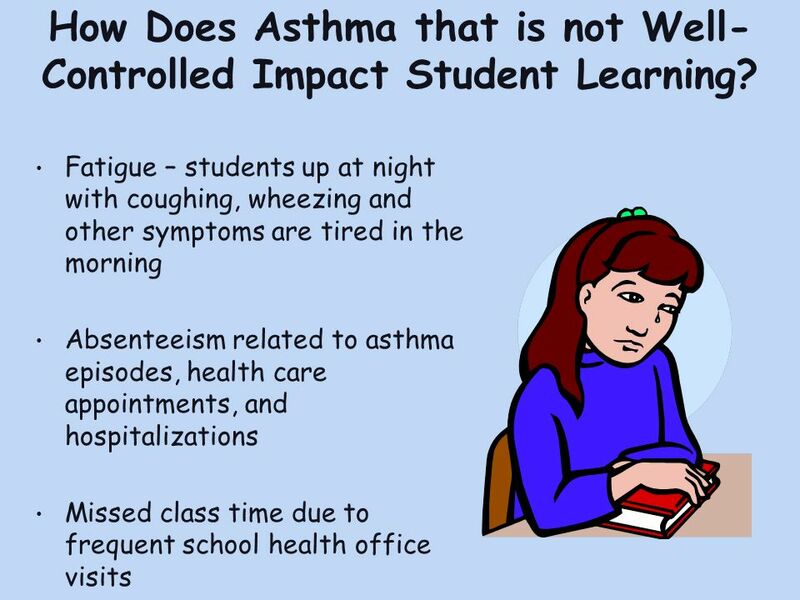 7 How Does Asthma that is not Well-Controlled Impact Student Learning? Fatigue – students up at night with coughing, wheezing and other symptoms are tired in the morning Absenteeism related to asthma episodes, health care appointments, and hospitalizations Missed class time due to frequent school health office visits Script Notes: Student learning can be impacted by fatigue, absenteeism, or symptoms that interrupt students’ attentiveness. An asthma episode is distracting and upsetting to other students and staff. Students with asthma sometimes experience lower self-esteem. Students’ academic success can be affected by the missed class time and absenteeism. Some students with asthma feel anxious about participating in physical education or other activities, because they’re afraid they will experience an asthma episode. 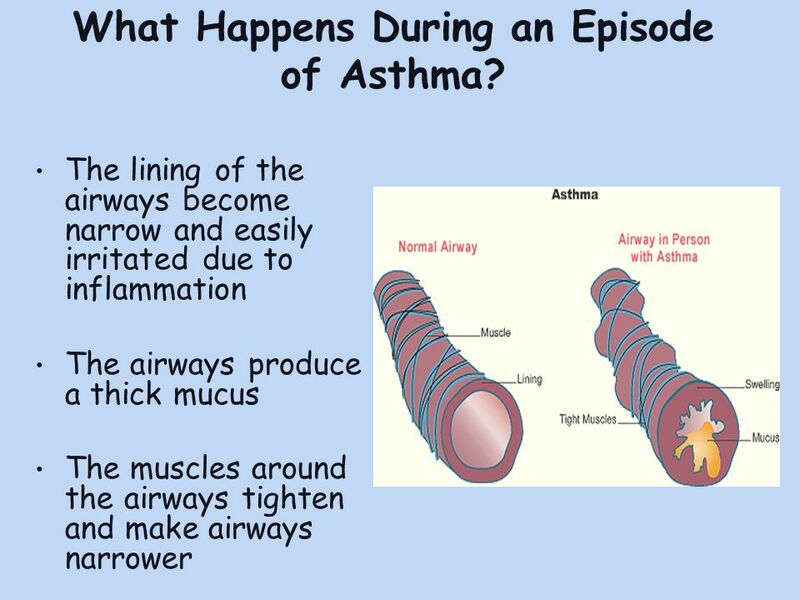 8 What Happens During an Episode of Asthma? The lining of the airways become narrow and easily irritated due to inflammation The airways produce a thick mucus The muscles around the airways tighten and make airways narrower Script Notes: Three things can happen during an asthma episode: Swelling of the airways Clogging- the mucus blocks the airways and thus allows less air to pass through the airways Squeezing- the air passages are squeezed together by the muscles that surround the outside of each airway. This combination of swelling, clogging, and squeezing dramatically reduces the size of the airways. 9 What Can Make Asthma Worse? Not all factors affect all people. It’s important to identify what affects a particular student’s asthma. Infections in the upper airways, such as colds Exercise Changes in weather and temperature Physical expressions of strong feelings (crying or laughing hard, yelling) Script Notes: Some things can make asthma worse and can initiate the onset of an asthma episode. Not all students with asthma are affected by the same factors, and their sensitivities can change over time. The most common cause of asthma episodes is colds or other upper airway infections, which is just one more reason to emphasize the importance of good handwashing. Some children only experience asthma symptoms during or after physical activity. This is referred to as exercise induced asthma (EIA). Changes in weather and temperature can affect some students’ asthma as well. 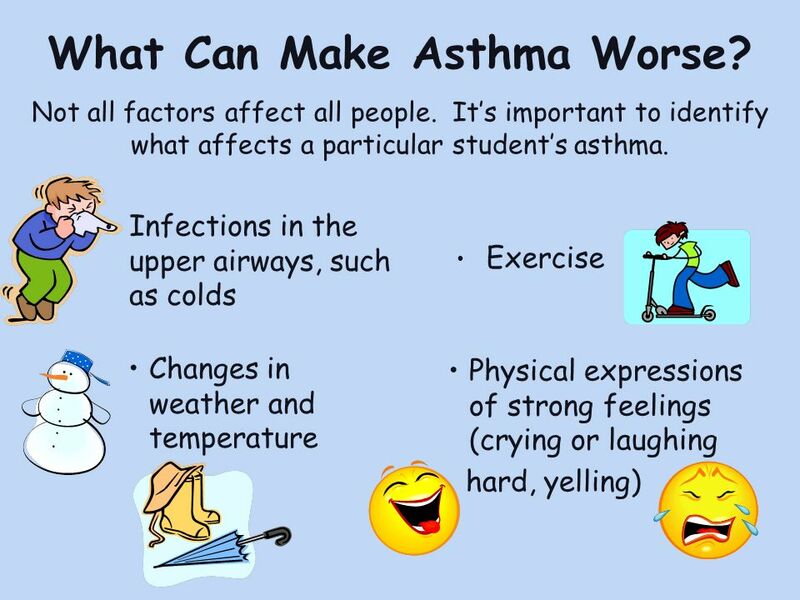 Strong physical expressions of feelings, such as crying or laughing hard, or yelling, can cause some students’ asthma to flare up. 10 What Can Make Asthma Worse? Allergens such as: Furred and feathered animals Dust mites Cockroaches Pollens from grass and trees Molds (indoors and outdoors) Script Notes: Classroom pets like rabbits, hamsters, gerbils, and parakeets may cause some students to have an asthma attack and should be removed. Most homes and schools in humid areas have dust mites. They are found in carpets, clothes, stuffed toys and fabric-covered items. Droppings, saliva, and the body parts of cockroaches and other pests can cause asthma attacks for some students. Some students’ asthma flares up when grass is cut at their school, especially if their classroom window is left open. Mold grows where moisture is present. All molds that are found growing inside a school building should be removed immediately. Note to presenter: The information found in this slide is found in the following sources: and has a Home, School & Play resource which describes these triggers and how to remediate them. 11 What Can Make Asthma Worse? 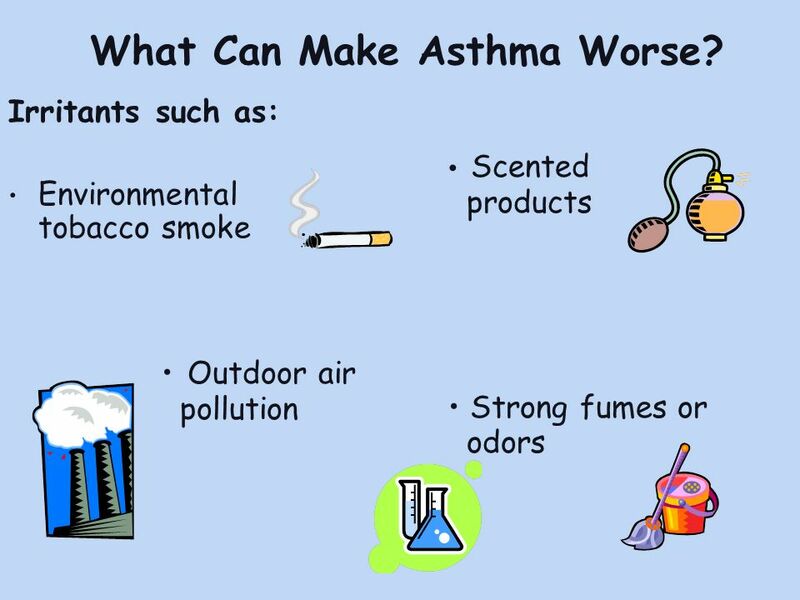 Irritants such as: Environmental tobacco smoke Scented products Strong fumes or odors Outdoor air pollution Script Notes: Tobacco smoke can actually contribute to causing asthma, in addition to causing many students with asthma to experience asthma symptoms. Outdoor air pollution, including diesel exhaust from school buses, can cause asthma episodes. Poor outdoor air quality can also be a problem. Scented products, such as perfumes, body creams, cause some students’ asthma to flare-up. Some classrooms, such as art rooms, science labs, and career and technical education classrooms, have strong odors from chemicals used. Strong fumes or odors from chemicals such as cleaning products, pesticides, and paint can cause some students’ to have an asthma episode. 12 Is There A Cure For Asthma? 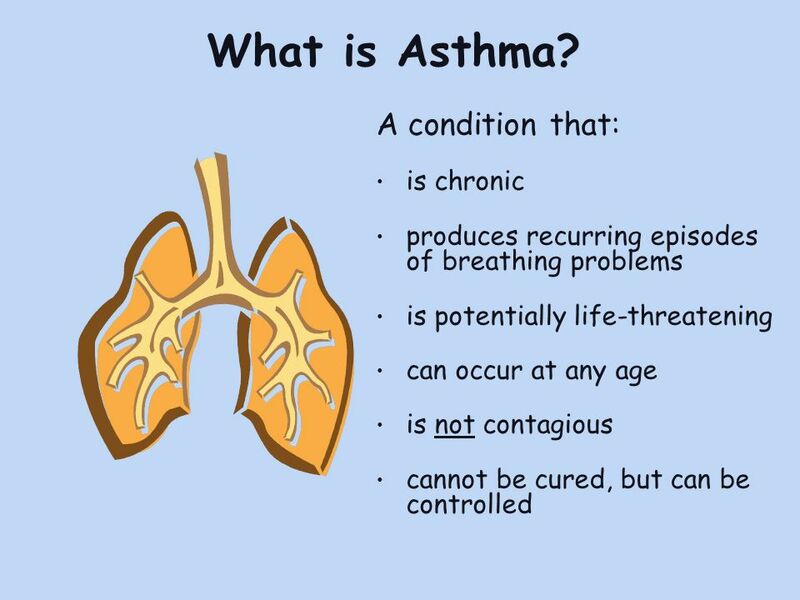 Asthma cannot be cured, but it can be controlled. Most young people with asthma should be able to live healthy, active lives with minimal symptoms. Script Notes: There is no cure for asthma, but it can be controlled. Most young people with asthma should be able to live healthy, active lives with minimal symptoms. 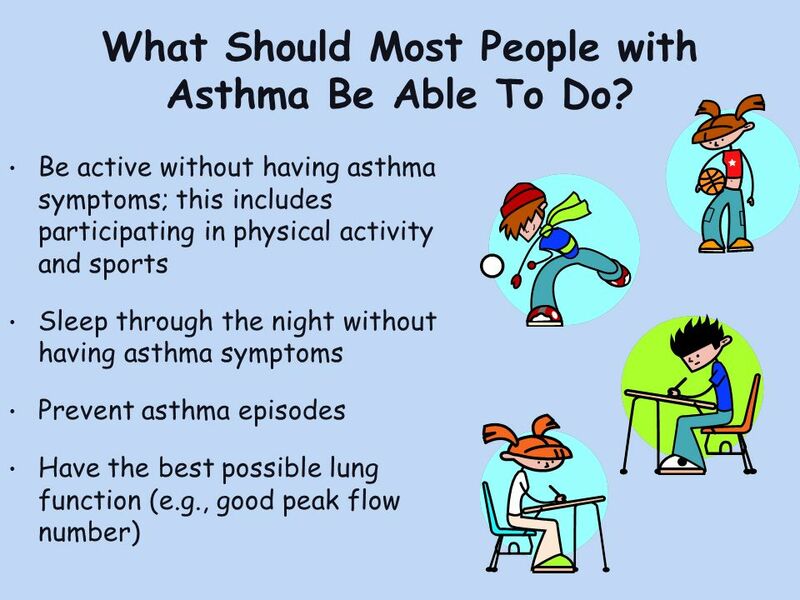 13 What Should Most People with Asthma Be Able To Do? Be active without having asthma symptoms; this includes participating in physical activity and sports Sleep through the night without having asthma symptoms Prevent asthma episodes Have the best possible lung function (e.g., good peak flow number) Script Notes: Students with well-controlled asthma should be able to do everything a person without asthma is able to do. They should be able to: Be active without having asthma symptoms; this includes participating in physical activity and sports Sleep through the night without having asthma symptoms Prevent asthma episodes Have the best possible lung function (e.g., good peak flow number) Note to Presenter: Asthma is not under good control when a student has asthma symptoms or uses a quick-relief inhaler for asthma symptom control (not prevention of exercise-induced asthma) more than 2 days per week. Asthma is also not under good control if it interferes with any normal activities. Additionally, for children ages 5-11, if a student has asthma symptoms multiple times on any day, his or her asthma is not under good control. If a 5-11 year old child has nighttime awakenings due to asthma more than once a month, his or her asthma is not under good control. Nighttime awakenings more than twice a month is the limit for those 12 and older. 14 How Is Asthma Controlled? Follow an individualized, written asthma action plan Reduce or eliminate exposure to things that can cause asthma symptoms Encourage and support use of medication as prescribed -	Quick-relief medicine for all students with asthma -	Long-term control medicine for students with persistent asthma Script Notes: How can we help students control their asthma at school? Follow an individualized, written asthma action plan. Each student’s asthma action plan should come from his/her physician or other health care provider and be signed by parents and school nurse. If a student in a classroom is sensitive to specific allergens or irritants, reduce or eliminate student those allergens or irritants. 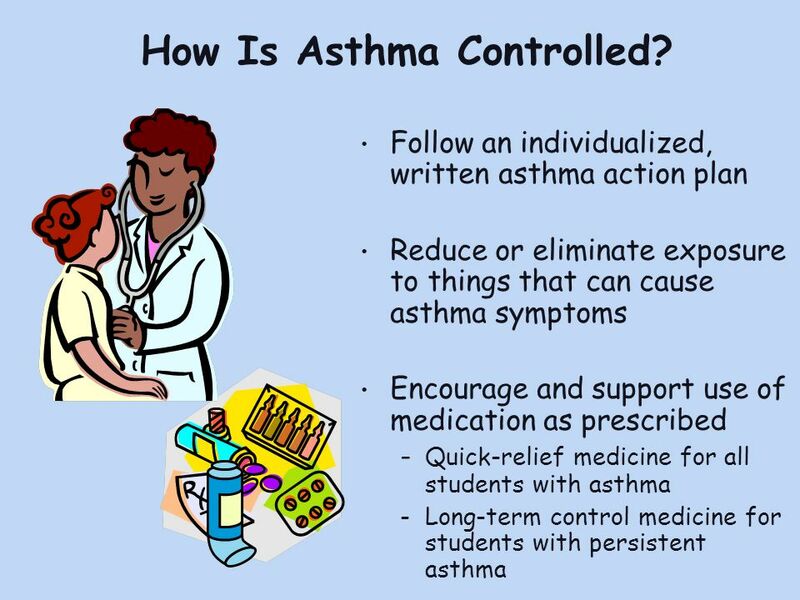 Encourage students to use their asthma medications, as prescribed. For some students with only occasional symptoms, this may mean using just a quick-relief medicine to relieve symptoms. For others, it may mean using daily, long-term control medicine as well as quick-relief medicine when needed. Note to presenter: Sample asthma action plans can be found at Long-term control medicine handles inflammation and prevents episodes from occurring. Quick-relief medicine (many of these medicines are inhaled and start to work within a few minutes, such as albuterol inhalers, bronchodilators, metered dose inhalers or MDIs) should be used at the first sign of symptoms and need to be immediately available. If you think a student is overusing their quick-relief medicine, do not take it away, but instead review their plan and call their parents. Some students may need to use their quick-relief medicine before they participate in vigorous physical activity to help prevent onset of asthma symptoms. 15 How Is Asthma Controlled? Monitor response to treatment and level of asthma control Encourage regular follow-up care Ensure good communication among school, the student’s doctor, and home Script Notes: To help students control their asthma, we can also: Monitor students’ response to use of their quick-relief medicine by noticing symptoms and having them measure their breathing by using a peak flow meter. Monitor level of asthma control. Encourage students to seek medical care when they experience asthma symptoms, as well as for well visits. Encourage regular communication and health updates among the school, the student’s doctor, and his/her parents/guardians. 1. Is your school free of tobacco smoke? 2. May students carry their own asthma medicines? 3. Does your school have an emergency plan for kids with severe asthma episode? Note to Presenter: If you are not planning to present on slide set #2, you may want to add additional information about some of these items while using these slides. See Slide Set #2 for more information about each of the items listed. 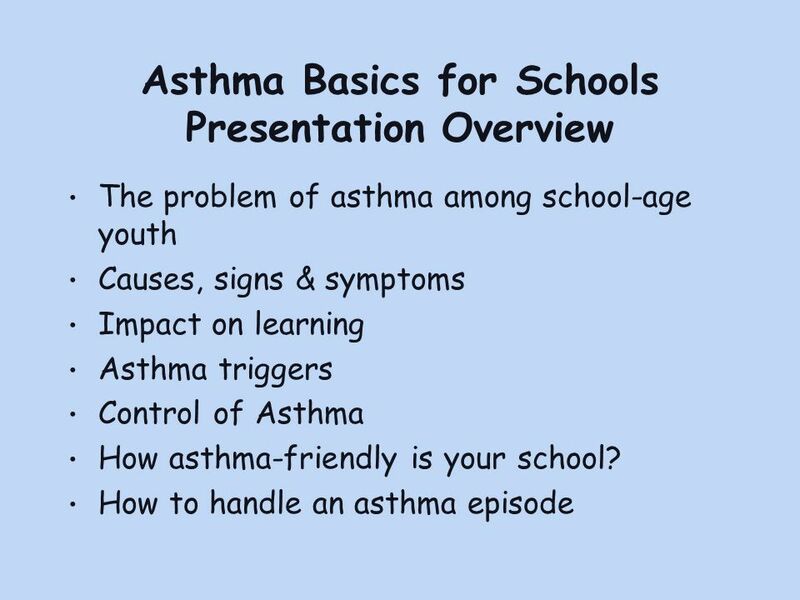 The script notes provide the exact language from the National Asthma Education and Prevention Program document “How Asthma-Friendly Is Your School?” The text on the slide is shorthand for the longer text included in the script notes. Script Notes: Children with asthma need proper support at school to keep their asthma under control and be fully active. 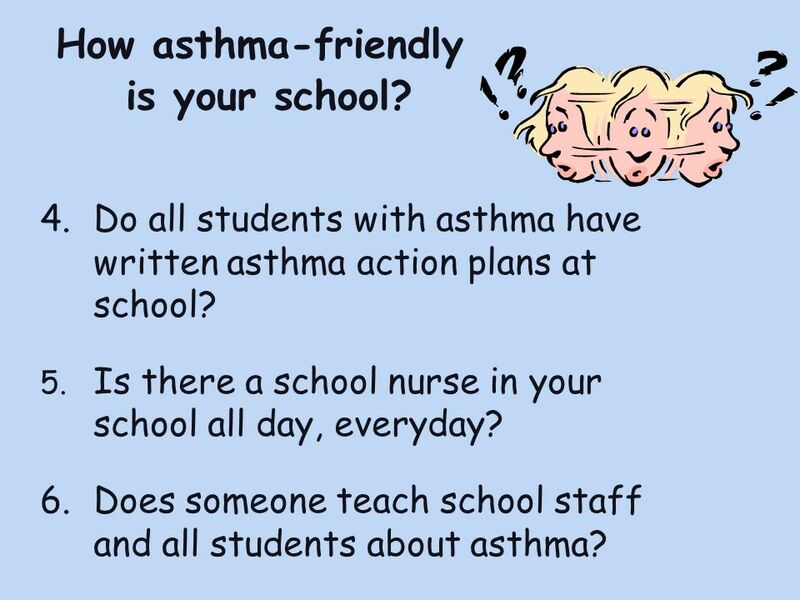 Use the questions below to find out how well your school assists children with asthma: 1. Is your school free of tobacco smoke all of the time, including during school-sponsored events? 2. Are students permitted to take medicines at school as recommended by their doctor and parents? May students carry their own asthma medicines? If some students do not carry it, can they quickly find and use their medicines? 3. 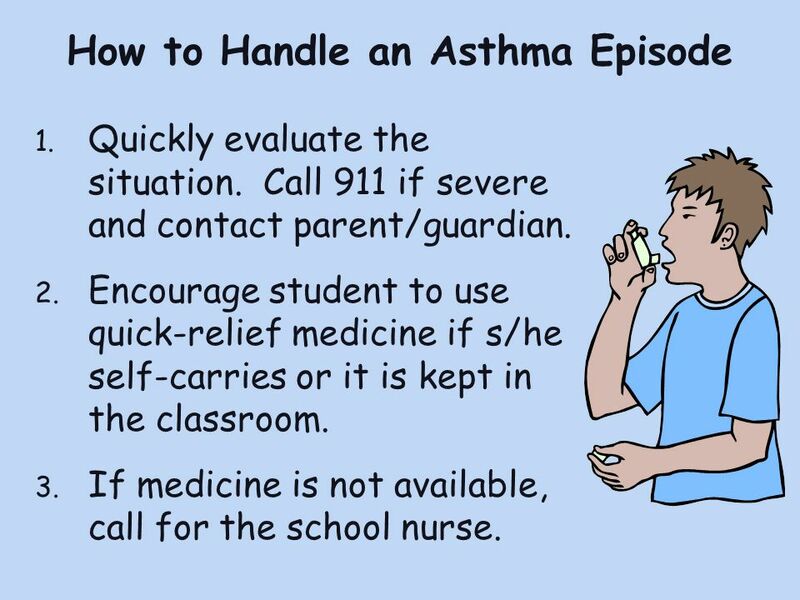 Does your school have a written emergency plan for teachers and staff to follow, to take care of a student with an asthma episode? Is it made clear what to do? Who to call? When to call? In an emergency, such as a fire, weather emergency, or lockdown, or if a student forgets his/her medicine, does your school have quick-relief medicines for students to use? 5 National Asthma Education and Prevention Program. 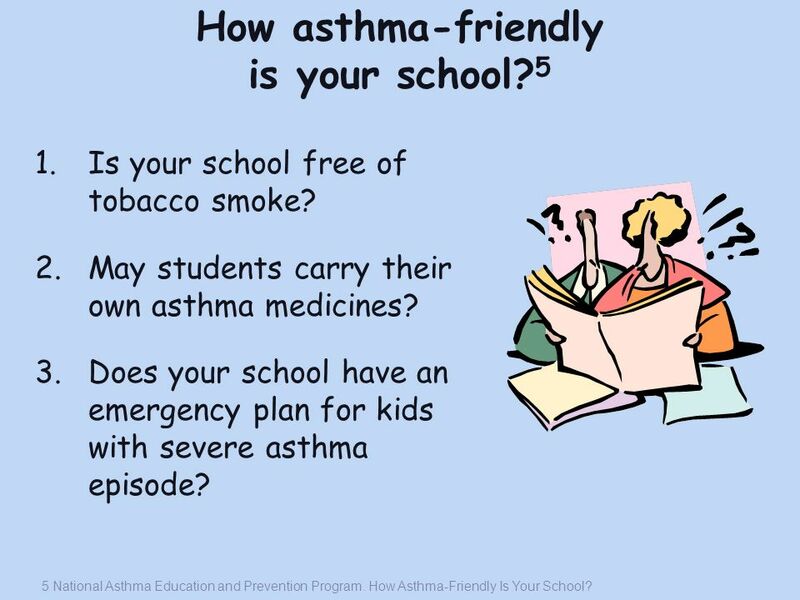 How Asthma-Friendly Is Your School? 17 How asthma-friendly is your school? 4. Do all students with asthma have written asthma action plans at school? 5. Is there a school nurse in your school all day, everyday? 6. Does someone teach school staff and all students about asthma? Script Notes: 4. Do all students with asthma have updated asthma action plans on file at the school? 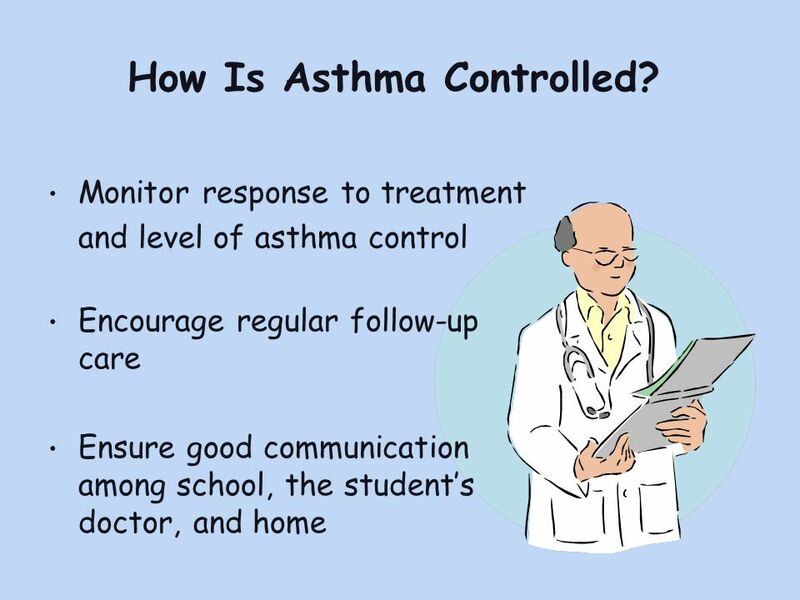 An asthma action plan is a written plan from the student’s doctor to help manage asthma and prevent asthma episodes. 5. Is there a school nurse in your school all day, every day? Does a nurse identify, assess and monitor students with asthma at your school? Does he/she help students with their medicines, and help them be active in physical education, sports, recess, and field trips? 6. Does the school nurse or other asthma expert teach school staff about asthma, asthma action plans, and asthma medicines? Does someone teach all students about asthma and how to help a classmate who has asthma? 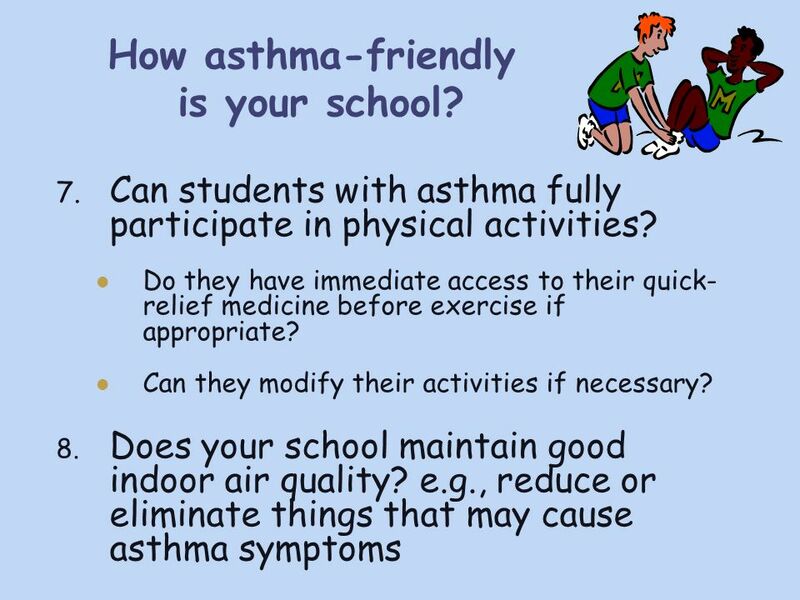 18 How asthma-friendly is your school? Can students with asthma fully participate in physical activities? Do they have immediate access to their quick- relief medicine before exercise if appropriate? Can they modify their activities if necessary? 8. Does your school maintain good indoor air quality? e.g., reduce or eliminate things that may cause asthma symptoms Script Notes: 7. Can students with asthma fully and safely join in physical education, sports, recess, and field trips? Are students’ quick-relief medicines immediately accessible before and after they exercise? Can students with asthma choose a physical activity that is different from others in the class when it is medically necessary? Can they choose another activity without fear of being punished? 8. Does the school have good indoor air quality? Does the school help to reduce or prevent students’ contact with allergens or irritants, indoors and outdoors, that can make their asthma worse? Allergens and irritants include mold, dust mites, cockroaches, and strong odors or fumes from things like bug spray, paint, perfumes, and cleaners. Does the school exclude animals with fur or feathers? Not all students with asthma are affected by the same factors and their sensitivities can change over time. Quickly evaluate the situation. Call 911 if severe and contact parent/guardian. Encourage student to use quick-relief medicine if s/he self-carries or it is kept in the classroom. If medicine is not available, call for the school nurse. Note to presenter: Please customize this slide and the notes below for your particular school and district. The steps outlined below may be used by school health directors or coordinators as a template to develop a district or school protocol. This protocol should be used along with other school asthma management materials, including instructions for evaluating students and administering inhaled medication. Script Notes: Every school should have a specific plan for handling asthma emergencies for students without an asthma action plan. Probably the most important thing any school staff member needs to know is how to handle an asthma episode. For some students, this can prevent a visit to the emergency room, hospital, and in the most severe cases, it can prevent them from dying. Steps for Handling Asthma Symptoms at School: If a student in your class has asthma symptoms (shortness of breath, wheezing, tightness in the chest, coughing), if possible, follow that individual student’s asthma action plan. If a student does not have a personal asthma action plan, use your school’s written emergency care plan. (States or districts usually have a standard format for such plans.) This emergency plan often includes the following steps: Quickly evaluate the situation. Call 911 if the student is in severe distress (unable to speak, lips blue). If the student self-carries or quick-relief medicine is kept in the classroom, encourage him/her to use the medicine as directed. If the quick-relief medicine is not in the classroom, call for the school nurse (or designee). 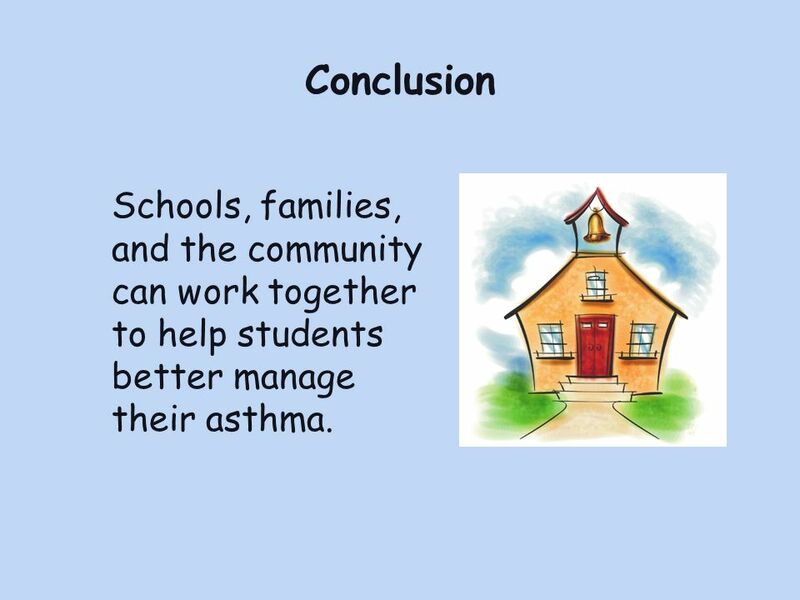 20 Conclusion Schools, families, and the community can work together to help students better manage their asthma. Note to presenter: If you are continuing the presentation, you may want to skip this slide and go directly to slide 2 of the Part 2 presentation. Script Notes: Together we can make a difference. We can take steps to help students keep their asthma under good control at school, and we can make sure students get the care they need if they have an asthma episode at school. Note to presenter: Ask the audience if they have any questions (be prepared to respond or refer questions). Then, thank the audience for attending the presentation, and ask them to complete and submit the presentation feedback form. 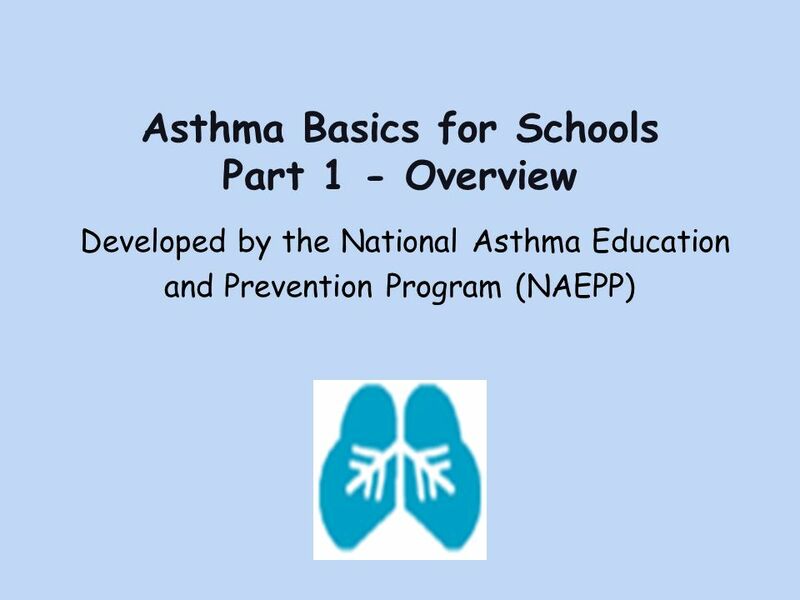 Download ppt "Asthma Basics for Schools Part 1 - Overview"
What You Need to Know About Asthma Going for the 3 Increases: Increase in Health, Increase in Happiness & Increase in Energy Strategies for Success in. Youth Asthma Epidemic Hannah Lewis. Asthma Management In Educational Settings Physical Education Teachers and Coaches Education Module. New Providence School District Asthma Education for School Staff Carol McCabe, R.N. Jan Miller, R.N. Trish Kalinger, R.N. 1 Asthma Management In Educational Settings Classroom Teacher Education Module. What every parent needs to know about Childhood Asthma This program is brought to you by Allies Against Asthma, a workgroup of the Consortium for Infant. Long Beach Alliance for Children with Asthma We CAN Control Asthma Now. Asthma and Work-related Asthma Developed by: Dana Hughes, RN, PhD Miners Hospital, University of Utah Libbey M. Chuy, MPH Asthma Program, Utah Department. Take a Deep Breath Asthma in Children Michael W. Peterson, M.D. Professor and Chief of Medicine UCSF Fresno. A Public Health Response to Asthma A call to action for organizations and people with an interest in asthma management to work as partners in reducing. Asthma A Significant Health Problem Affecting Millions of Children Kayleigh Ringer EEC 4731 Module 2 Young Children’s Health Issues.